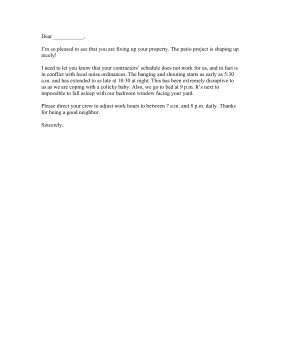 This sample complaint letter is intended for neighbors who have loud construction projects happening in the early morning or late at night. I'm so pleased to see that you are fixing up your property. The patio project is shaping up nicely! I need to let you know that your contractors' schedule does not work for us, and in fact is in conflict with local noise ordinances. The banging and shouting starts as early as 5:30 a.m. and has extended to as late at 10:30 at night. This has been extremely disruptive to us as we are coping with a colicky baby. Also, we go to bed at 9 p.m. It's next to impossible to fall asleep with our bedroom window facing your yard. Please direct your crew to adjust work hours to between 7 a.m. and 8 p.m. daily. Thanks for being a good neighbor.